Which Road to Social Revolution ? Since the End of First World War , there were two revolutions running parallel in India , the national and the social revolution . It was believed that the national revolution would be completed with the independence but the social revolution must go on . According to K. Santhanam a prominent southern member of the Assembly , there were three revolutions at that time , Political , Social and Economic revolution . The political revolution would end with independence . The social revolution meant to get India out of the medievalism based on birth , religion , custom , and community and reconstruct her social structure on modern foundations of law , individual merit , and secular education . The third revolution was an economic one , which was the transition from primitive rural economy to scientific and planned agriculture and industry . The Constituent Assembly's task was to draft a constitution that would serve the ultimate goal of social revolution . But the task was far more complicated than the simple drafting of fundamental rights or the moral precepts of a preamble . If the country were not united , if the government were not stable , if the government lacked the co-operation or the acquiescence of the people , there could be no economic progress and no government initiative for social change . What political institutions , therefore , would help to accomplish these subsidiary aims and so establish the conditions in which social change could more easily take place ? At the time when the members of the constituent assembly were framing constitution to serve the ultimate purpose of social revolution , the question arose at that time was , which form of government would best serve the above mentioned purpose ? Whether to look to the Euro - American constitutional tradition , that mean continuing in the direction India had taken during the colonial period . Or if the Assembly members searched the nation's rich heritage to find indigenous institutions capable of meeting her needs , it would result , most likely , in basing the Constitution on the village and its panchayat and erecting upon them a superstructure of indirect , decenteralized government in the 'Gandhian' manner . In either case the constitution must be democratic , there was to be no return to the Indian precedent of a despot with his durbar , nor would the assembly have Europe's totalitarianism or the Soviet system . Gandhi submitted two plans - one in January 1946 and the other in January 1948 - to the committee charged with revising the Congress Constitution . The second plan was based on a nationwide network of panchayats . Each village panchayat , in Gandhi's plan , would form a unit , two such panchayats would constitute a working party with an elected leader . Fifty leaders would elect a second grade leader , who would co -ordinate their efforts and who would also be available for national service . Second -grade leaders could elect a national chief to 'regulate and command all the groups' . The party's constitution committee , under the influence of the Working Committee , did not accept Gandhi's suggestions , believing that the Congress could neither forego its political role nor become so utterly decentralized . The Assembly's decision to give India a parliamentary , federal constitution was not made in a day . The process took the two and a half years from the meeting of the Congress Experts Committee on the Constitution Assembly , held in July 1946 , to the debate on Draft Constitution in November 1948 - when panchayats were relegated to the Directive Principles and indirect election died a quiet death . It was the Congress Experts committee that set India on the road to her present constitution . This committee , with Nehru as its chairman , was set up by the Congress Working Committee to prepare materials for the Assembly , to which six of its eight members had recently been elected . Patel , although not a member , attended many constitution committee meetings . These began in mid-July 1946 with four days of sessions and resumed a month later for a like period . The committee members , working within the frame work of the Cabinet Mission scheme , made general suggestions about autonomous areas , the powers of provincial governments and the centre , and about such issues as the Princely States and the amending power . They also drafted a resolution , closely resembling the Objectives Resolution , which would appear that December , laying down that powers was derived from the people and naming the social objectives of the constitution . 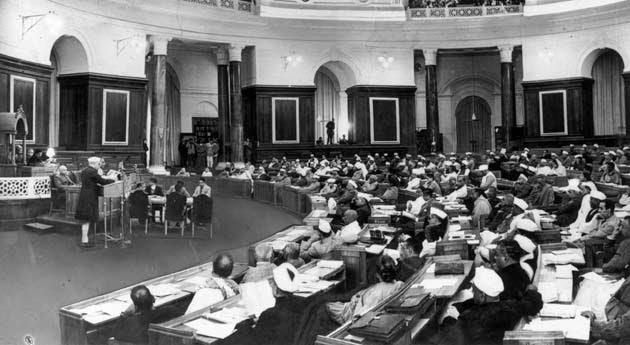 Although the Cabinet Mission had presumably believed that India will find its source of inspiration in the 1935 Act , there was still room within its plan for a system of indirect , panchayat government had the Experts Committee wanted to make such a suggestion to the Assembly . The committee ignored the Gandhian approach , however , considering only the institutions of parliamentary government and recommending tentatively that the constitution be loose federation . Objectives Resolution said that the new constitution would be dedicated to the goal of social revolution , but it did not specify how these aims were to be achieved . Neither panchayat nor indirect government were mentioned and the allusion to decentralization were obviously made in defense to the Cabinet Mission Plan . It was reasonably clear , however , that the Assembly leadership was not contemplating a Gandhian constitution . In the debate on the the resolution , there was neither criticism of the omission of panchayat government nor was the subject mentioned . Members spoke of democracy , socialism , and the responsibilities of legislatures , but not of the necessity for an 'Indian' form of government . Even so it appears that Assembly leaders intended to omit all mention of panchayats from the Constitution and only under strong pressure did the leadership grudgingly agree that an article concerning panchayats should appear in the Directive Principles . On 22 November 1948 , K . Santhanam moved the party's official amendment , the Assembly adopted it and thus Article 40 came into the Constitution . After its approval , H.C. Mookerjee , the acting president of the Assembly , somewhat wishfully said , 'I have not found anyone who has opposed the motion put forward by Mr. Santhanam' . So far as the Constitution was concerned , the panchayat issue was settled and India was surely committed to direct , parliamentary government .